Devin Townsend’s already starting on more records? Devin Townsend’s two new albums, Ghost and Deconstruction, still haven’t been officially released. They’ll be landing on June 20th; however Deconstruction leaked online just a few weeks ago, and features some all-star guest appearances. 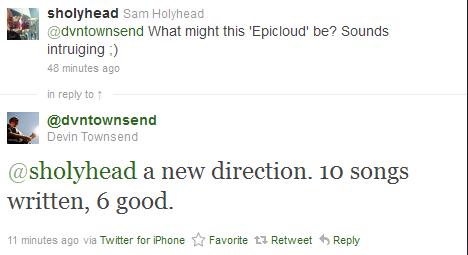 For Epicloud, Townsend has supposedly written ten songs already according this other tweet. It’s early days right now and HevyDevy has some touring coming up in support of Ghost and Deconstruction but it’s of course good news to hear that the mad scientist of metal is showing absolutely no signs of slowing down.